Miners demonstrating in DC. Photo: UMWA. This edition of the Lunch Pail is dedicated to the workers at NBC Peacock Productions who unionized with the WGA East. Congratulations! This past week has been our best fundraising week so far. Dipping into money earned from her royalties of the New York Times bestseller Nickel and Dimed, Barbara Ehrenreich joined the ranks of Payday’s dues-paying readers. Also joining this week were Nashville native Benjamin Poremski, retired Pennsylvania Judge Wayne Hanson, Tampa telephone worker Norwood Orrick, Steve Zeltzer, James McElhatton, Sean Collins, Prashanth Mundkur, and Peter Gilmore. Thanks to all! If you’d like to support our work, go here. In January, the EPA and the Department of Justice announced that they were suing Volkswagen, seeking $46 billion in damages for violations of the Clean Air Act. Following the announcement of the lawsuit, workers at the Volkswagen plant in Chattanooga say that supervisors began holding meetings where they told workers that they could be fired if they spoke publicly about the emissions scandal. At several meetings, Volkswagen managers projected on a screen a comment left by a Volkswagen Chattanooga worker on the website VWvortex.com. Management then informed the workers that the commenter had been fired. Managers made it clear to workers that VW was actively monitoring social media and websites. As the company was negotiating a settlement with the federal government, Volkswagen management stressed to workers time and again in group meetings and in one-on-one conversations the importance of not talking to the media or regulators about the ongoing emissions scandal. “It was made known to us that in light of the emissions scandal, speaking with media would not be tolerated,” a worker told Payday. Out of fear of losing their job, they did so on on the condition of anonymity. To read more, check out our story on the international scandal unfolding here in Chattanooga. Coal Miner Pension Bankruptcy Bill Moves Forward, But Could Super PAC Donor Stop It? This week, the Senate Finance Committee approved the Miners Protection Act by a vote of 18 to 8. The bill would transfer up to $490 million per year – and an estimated average of $220 million per year over the next decade – from the EPA’s Abandoned Mine Lands to the United Mine Workers’ benefit and pension programs. In addition, the bill would revise the Coal Act, which provides government-funded health care to retirees at bankrupt companies, to cover miners whose companies have gone bankrupt after the bill was last revised, in 2006. 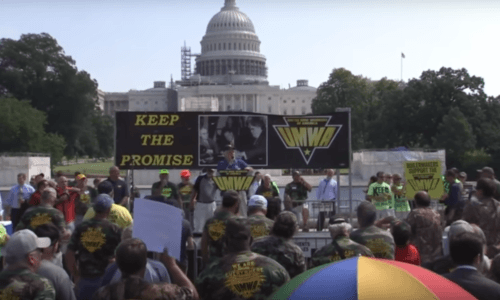 If something isn’t done, the UMWA pensions of 89,000 retirees or their family members and 22,000 others who have not yet begun to receive benefits are at risk, as well as the health benefits for another 22,000 miners. The bill has received widespread bipartisan support from Senators as varied as Rob Portman (R-OH), Ron Wyden (D-OR), Joe Manchin (D-WV), and Shelley Moore Capito (R-WV). It is enjoying support as well from the owners of unionized coal companies who are worried about pension obligations in bankruptcy courts. Even some coal company owners such as Murray Energy CEO Bob Murray support the bill. However, one prominent coal owner, CEO Joe Craft of non-union Alliance Resource Partners, doesn’t support it. His influence was seen as key to Senator Mitch McConnell’s refusal to bring a similar bipartisan bill to a vote in 2014. In the 2014 election, Alliance was McConnell’s 6th largest campaign contributor, providing $93,450 to the McConnell campaign. In addition to these direct campaign contributions, Craft gave $300,000 to the pro-McConnell Super PAC Kentuckians for Strong Leadership. This time around, Manchin and Capito appear to have confidence that they can get McConnell to let the bill come up for a vote. In 2010, Chattanooga become the first city in the United States to offer fiber optic internet at a gigabyte per second. The program’s success is widely credited to the fact that it was administered by the municipally owned Electric Power Board, whose workers are represented by IBEW Local 175. In 2015, Chattanooga became the first city in the world to offer ten gigs per second internet. However, AT&T and Comcast have spent heavily in Tennessee to prevent other cities from following suit and installing their own municipally owned broadband services. Nashville, in an attempt to catch up with Chattanooga and other cities, has passed a “One Touch Ordinance” that would allow Google to install a fiber optic lines on those previously serviced by CWA Local 3808-represented AT&T workers in Nashville. The proposed “One Touch” ordinance forces AT&T to abandon its long history of using union-represented employees for work on AT&T lines. Those union jobs have played an important part in providing opportunity for Nashvillians like me. I started my career at AT&T in 1997 in a union-represented position. Today I am a sales coach, in a management position. Especially for African American women, career opportunities can be limited and union representation can help pave the path to the middle class. It’s no surprise that African Americans lead the way in union representation, with more members than any other ethnicity. These good-paying union jobs are offering minority women tremendous professional opportunities and even better lives. That kind of opportunity means so much more than any brand or label. Our Metro Council members should think about the role of AT&T’s Union-represented employees in building – and broadening – Nashville’s middle class. (Full Disclosure: Payday Senior Labor Report Mike Elk is a member of the Washington-Baltimore NewsGuild, an affiliate of CWA). Twice this summer, non-union ironworkers in Nashville have gone on strike to protest unsafe working conditions and a lack of water. However, a recent report by Nashville Public Radio concludes that the city’s shortage of construction workers must stem from the fact that the younger generation doesn’t want to work in or isn’t aware of the construction industry, where the starting wage for ironworkers is as low as $12/hour. Just as a point of reference, if the minimum wage had kept pace with productivity growth over the last fifty years it would be over $18 an hour now. So Nashville’s public radio station apparently believes that as a matter of principle (it’s not the market) construction workers should be earning less than a productivity-adjusted minimum wage. Only 26 days into this school year, Jefferson County School District, which serves the metro Louisville area, has already had to cancel some school bus routes on certain occasions. Teamsters Local 783, which represents the bus drivers, says that the district is 50 drivers short of the necessary amount to fully staff the routes. Like the Nashville story, no mention is made of low wages as being part of the problem. Nonetheless, the school district appears to be addressing the issue, in part because of recent contract negotiations with its teachers. The school board will be voting to increase the wages to $14 an hour for the 800 public school employees who currently make less than that amount. A new study out by the Alabama State Banking Department shows that a total of 246,824 Alabamians took out almost 2.1 million payday loans since August 2015. The average loan was for $326 and the average fee was $56, nearly 20%. “These loans are marketed for emergency use only. If somebody is taking out that many in a year, it means they are using them to pay the bills,” Stephen Stetson, a policy analyst at Alabama Arise, told AP. The strike of prison workers organized by the Industrial Workers of the World that started on September 9 is one of the largest in the nation’s history. According to the IWW’s Incarcerated Workers Organizing Committee, the strikes have now spread to 46 prisons across the U.S.
National outlets, including the other broadcast networks ABC and NBC; the leading cable news channels, Fox News, CNN and MSNBC; the public networks, PBS and NPR; and prominent newspapers like the New York Times, Washington Post and USA Today, offered no coverage of the prison strike. To read some great alternative media reporting on the prison strikes, check out Prison Protest columnist Brian Sonenstein’s reporting over at Shadowproof. On Thursday, Vincent (who asked the INDY not to use his last name) will go to court after already serving six months in the Durham County Detention Facility to learn whether he still owes the state $900 in unpaid child support, which led to his incarceration. This, despite the fact that he worked essentially full time in the jail’s kitchen while he was locked up—all unpaid. Technically, he was a volunteer, though he chuckles at that description. “If you’re going to hire inmates, you should pay them,” he says. “How can you work for someone, get released, and then still owe money? This past week, the Fraternal Order of Police, the largest police union in the country, endorsed Republican Donald Trump for president. The endorsement set off much headshaking within organized labor, which is seeking to make inroads with the #BlackLivesMatter movement. This proposed ordinance would categorize offenses committed against police officers, firefighters, and emergency medical technicians as hate crimes. It distorts the purpose of hate crime legislation and we cannot sit idly by as it is discussed in our city government. Another concern with the ordinance is its potential to derail the work underway within the city and across the country to bring about change. For example, the Chicago Alliance Against Racist and Political Repression and allied groups are pressuring the City Council to enact a Civilian Police Accountability Council, or CPAC. Community Renewal Society has also proposed a FAIR COPS Ordinance that proposes changes in police oversight policies at both the city and state levels. Nationally, the Movement for Black Lives recently proposed a bold platform for systemic racial justice. In a city and nation already divided and wracked with problems, the passage of “Blue Lives Matter” bills will only create more polarization and distract from conversations on the urgent need for police accountability and racial justice. Last week, Payday brought you the story of AFL-CIO President Richard Trumka abandoning his allies in the environmental community to endorse the Dakota Access Pipeline. The move was quickly denounced by AFL-CIO unions including Communication Workers of America, National Nurses United, and the Amalgamated Transit Union. Now, Common Dreams has obtained internal emails that show that the Building Trades have declared war on the unions opposing them. To see how union leaders are reacting to the incendiary remarks by McGarvey, check out Jon Quelly’s full story at Common Dreams. Last week, we also reported the Oklahoma Supreme Court ruling that Oklahoma’s law allowing corporations to opt out of paying into the state’s workers compensation system was illegal. Now, Texas is the only remaining state in the nation that allows corporations to opt out from worker’s comp. However, legal experts question if it is likely that Texas courts will repeal the law since the constitutions of Texas and Oklahoma are so different. The Texas AFL-CIO told the Texas Tribune that it intends to look at its options. At the very least, the group plans to push legislative changes to Texas’s worker compensation opt-out law. Two UNITE HERE presidents in Florida wrote a letter to the Orlando Sentinel in response to the lack of coverage of the “historically significant wage increases won by 38,000 workers at Disney in their union negotiations” in a story about rising incomes in Orlando. Texas Republicans are again attempting to prohibit unions from being able to deduct dues from the paychecks of government employees who are union members. A developer in the District of Columbia might have to forfeit a $46 million taxpayer subsidy for not hiring enough local construction workers. During the once infamous Loray Mill strike of 1929, Ella united workers with songs that spoke to the need for better pay and improved working conditions. Though the strike was unsuccessful in achieving its demands, it sent a message about the plight of mill laborers that reverberated across the South. Just three days before her 29th birthday, Ella was riding to a union meeting in the back of a pickup truck. On the way there, the truck was ambushed by a group of armed men. An unarmed Ella was shot in the chest and killed. Five men were indicted for her murder, but all were acquitted in less than 30 minutes of deliberation. What’s confusing is that if this new class of robots isn’t cutting down on labor costs, it’s difficult to understand why companies would invest in them. If you aren’t saving money in the long run, then why buy new expensive technologies? The answer might be speed. In 2014 according to Amazon, the Kiva robots were able to shave more than an hour off the average order. It’s only likely that they’ve improved since then. Locus claims that their robots are even faster—up to 75 percent quicker than the Kivas. Thanks for reading this week’s Lunch Pail. We hope you’ll consider supporting our work and become a dues-paying member. Also, consider sending some money to the Durham Solidarity Center, which is accepting donations to cover legal costs for people protesting the police killing of Keith Lamont Scott in Charlotte, NC. Be the first to comment on "Nashville Fiber Optics Plan Could Cost Union Jobs – Miner Protection Bill Moves Forward – NBC Unit Wins Union after Votes Finally Counted"